In order to be successful, Realtors and real estate agents need to be experts on the art and science of marketing — not only marketing their clients’ real estate listings, but also marketing themselves. In many cases, your prospective clients will choose a real estate agent on the basis of trust, familiarity, and likability. As Dale Carnegie and many other thought leaders in sales and marketing have stated countless times: “People tend to do business with other people they know, like, and trust.” Getting people to know, like, and trust you is a multi-step process that encompasses everything from the quality and quantity of your website content to traditional marketing methods, such as sending out real estate prospecting letters and doing face-to-face networking and making phone calls. “Persistence breaks down resistance.” I’m not sure who originally coined that phrase, but it was one of my father’s favorite aphorisms, and one I enjoy passing along to others. 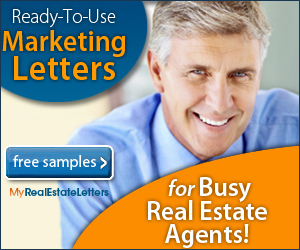 What Role Do Real Estate Marketing Letters Play? Marketing letters, which can run the gamut from letters of introduction to expired listing prospecting letters, can be an important building block in the success of your marketing campaigns. In a nutshell, here are some of the key elements of a well-rounded real estate marketing strategy — including real estate prospecting letters. Those are a few of the elements of an integrated marketing plan which you may want to incorporate into your real estate marketing strategy. Stay tuned to this blog for more real estate prospecting ideas, marketing tools, and success philosophies! Feel free to contact me if you have any questions or need help with blogging or website content development. Thanks for checking out my latest blog post! What Makes Real Estate Marketing Letters Effective? If you’re about to sit down in front of a computer screen and write a real estate marketing letter from scratch, I have good news: There is no need to reinvent the wheel! Instead of wasting hours of unproductive time writing prospecting letters, you can download an entire collection of 320 marketing letters, client prospecting letters, and farming letters that can be used for a wide variety of marketing and networking purposes. There’s also a free example of an expired listing prospecting letter, which provides you with the basic ingredients for communicating with prospective clients and generating inquiries, leads, and new client relationships. Although this marketing letter example is geared to expired listing prospects, it also contains a lot of verbiage that can be used in real estate prospecting letters, real estate agent introduction letters, and other types of marketing letters for real estate. In addition to the sample real estate letters available on the website “My Real Estate Letters,” you also have the option of downloading some user-friendly real estate marketing software that can streamline virtually every aspect of writing effective real estate marketing letters. The marketing kit also contains a wide selection of ready-to-use real estate thank you letters, requests for referrals and testimonials, new agent announcements, new Realtor introduction letters, and prospecting letters targeting FSBO prospects, short sale prospects, and apartment renters. Visit this site for the free real estate marketing letter sample (expired listing prospecting letter template). You’ll also find other marketing tools for real estate, including 260 client-oriented articles you can use in your real estate news letters, direct mail campaigns, and other real estate prospecting activities. Perhaps the most important element of effective real estate marketing is your level of personal commitment, motivation, and mental focus. Two books I’d recommend reading (and then rereading) are Think and Grow Rich by Napoleon Hill, and The Greatest Salesman in the World by Og Mandino. One of the best pieces of success advice I every read was in a book, called The Confidence Gap, A Guide to Overcoming Fear and Self-Doubt, by Russ Harris. In the book — which I’m due to reread, myself – he advises readers to clarify your personal values and then live by them. This relatively simple mental exercise can help strengthen confidence, motivation, and resolve. The author provides a free worksheet and guidelines for clarifying your values at his website. An effective real estate marketing letter should do at least three things: catch the attention of your prospects, establish the need for your services, and include a “call for action” that prompts the reader to call you, email you for more information, check out your latest blog post, subscribe to your email real estate news letter, or visit your website to peruse your latest real estate listings. One of the key ingredients to an effective real estate marketing letter is engagement. Enclose a small, free gift inside the envelope, such as an imprinted packet of garden seeds or a small calendar displaying your photo and contact information. Recipients will be much more likely to open the envelope and read the message if it’s obvious that there’s more inside than just a sales letter. Printing or stamping a short blurb on the envelope about the free gift, neighborhood news, real estate market update, or important information inside can also help increase the response rate of your mailing. There are different schools of thought when it comes to the return address on the envelope and what information to include in it. However you decide to handle it, one thing appears to be certain: A return address that identifies the letter as being from a real estate agent, agency, or Realtor will tend to reduce the number of prospecting letters that are actually opened, read, and responded to. One way to help catch your prospects’ interest at the beginning of your real estate marketing letter is to ask a relevant or intriguing question. Other introductory “hooks” can include compelling statistics, updates about the real estate market, or a statement that underscores the solid advantages of working with a licensed real estate agent or Realtor when buying or selling a house. Adding a “P.S.” at the end of your real estate farming letter can often be an effective way to grab attention, reiterate your “call to action,” and increase your response rate. Developing a real estate marketing plan is also a recommended idea. When you’ve taken the time to plan your marketing strategy and clarify your strengths, weaknesses, opportunities, and threats (SWOT), you’ll become more confident, proactive, and effective in building your business. A real estate marketing plan will help give you a competitive edge in the marketplace, improve your time management, and increase your productivity and momentum. Thanks for checking out my latest real estate marketing ideas and strategies. Stay tuned to this blog for more tips on real estate marketing letters, staying motivated, and maximizing your productivity as a real estate agent or Realtor. Reminder: As a starting point to writing more effective real estate prospecting letters, take a look at the free sample of an expired listing prospecting letter* that I mentioned earlier. Although it’s geared to expired listing prospects, the template can be modified and used as the basis for a variety of other real estate marketing letters. Best of luck in all your real estate marketing campaigns! *Disclaimer: Many of my blog posts on real estate marketing tips and tools feature links to digital products, email marketing services, and real estate marketing templates for which I am a compensated affiliate. As a side note, some of the links I post are provided solely for informational purposes and as a helpful resource. One of the main reasons that many real estate prospecting and marketing letters fail to generate the maximum number of responses and inquiries is that the first sentence doesn’t engage the reader. Sample introductory sentence #3: There are a lot of potential pitfalls to selling a home in today’s real estate market, so it pays to choose a real estate agent who is both dedicated and knowledgeable. While I’m not recommending that you use the exact wording of those sample openers — especially if they don’t reflect your personality or the current market conditions — I did want to give you some creative ideas on how to engage your audience with questions, thought-provoking statements, and even references to popular culture or quotes. Thanks for stopping by my real estate marketing blog. Stay tuned for more prospecting ideas, real estate marketing strategies, and examples of creative ways to write real estate farming letters and other types of agent-to-prospect communications. *Disclaimer: My blog posts feature links to websites and digital products for which I am a compensated affiliate. In spite of the multitude of online marketing options available to real estate agents, prospecting letters are still a tried-and-proven method of generating leads, increasing name recognition, and standing out from the competition. Getting Your Letter Opened: When you consider how inundated people are with emails, sales pitches, ads, and special offers of every description, it’s no wonder that a percentage of emails and real estate marketing letters and are never opened. You can reduce that number to a bare minimum by taking a few extra minutes to compose an intriguing subject line for your email marketing letters… or printing a brief blurb on the outside of your postal envelopes, one that would evoke curiosity or interest in what’s inside. It might take a little experimentation to discover what works best, but once you get in the flow of writing effective real estate marketing headlines, it should soon become second nature. Engaging the Prospect: Once you get the prospect to open the envelope or email, you have a few short seconds to spark their interest and draw them into the message. There are a variety of ways to do this, such as asking them a question they can relate to, making a statement that establishes the need for your services, or quoting a compelling statistic or trend in the real estate market that might affect them. That’s a quick overview of some of the potential sales hurdles you may face when sending out real estate farming letters, introduction letters, FSBO prospecting letters, and expired listing letters. By the way, if you need an example to follow for composing a professional-sounding expired listing prospecting letter, visit a website called “My Marketing Letters” and click on the yellow “Sample Letters” button. The website features a free sample of an expired listing letter, which you can use immediately to offer your services to potential clients in that target market. (Just add a few personal touches to the prospecting letter template, including the prospect’s name, your real estate designation, and your contact information. While I do not believe real estate prospecting letters are the be-all and end-all of real estate marketing tools, I do view them as a vital ingredient in a well-rounded real estate marketing plan. Although I’m a big believer in the power of the written word, I’ve seen a lot of sales letters that are anything but powerful! By keeping in mind the following marketing tips, your real estate farming letters will have a much stronger chance of being responded to. The appearance of your marketing letter will fall into one of two categories. It will either be inviting or off-putting (and I’m not talking about a golf outing). If your real estate prospecting letter is cluttered, full of typos and bad grammar, or accentuated by too many exclamation points!!! !… an preponderance of underlined phrases, an excessive use of bold lettering, or –and this is the worst offense of all– AN EXCESSIVE USE OF ALL CAPS (which looks like you’re shouting at them), then there’s a good chance your farming letter will be tossed in the recycling bin before they’ve gotten past the first paragraph! Don’t forget to leverage the “P.S.” in your real estate prospecting letter! Many people have a tendency to notice and read post scripts at the end of a letter — especially if they’re just visually scanning the message — so don’t miss out on the opportunity to reiterate a key benefits, include a “call to action,” or introduce an element of urgency, scarcity, or future uncertainty. By incorporating those three core concepts into your marketing strategy, your real estate prospecting letters will tend to be more results oriented and effective. Thanks for checking out my latest marketing strategy ideas, relative to real estate prospecting letters, farming letters, and real estate email marketing. Stay tuned to this blog for more marketing tips, marketing templates, and lead generation ideas for real estate agents and Realtors. Visit my website: Marketing Survival Kit, today! As someone with a background in integrated marketing communications, I have no doubt that real estate marketing letters can be an important element of a successful marketing campaign. Not only can a well-written real estate letter help introduce you to your farming area, but it can also facilitate client referrals, business relationships, and create top-of-mind awareness. Creating top-of-mind awareness is one of your most important real estate marketing strategies, for the simple reason that you want your prospects and professional contacts to think of you first when the services of a good real estate agent are needed. That’s why it pays to develop a cost-effective marketing plan that includes everything from developing a Web presence to distributing prospecting letters, real estate marketing postcards, email newsletters, or even press releases. One of the first steps to launching a successful real estate marketing campaign is to develop a marketing plan. A real estate marketing plan can include some or all of the following components, as well as other strategies and techniques I’ll mention in future blog posts. Offer workshops for first-time home buyers: Buying a new home, arranging financing, and handling the countless choices and decisions required can be pretty intimidating for first-time home buyers. By offering educational workshops for a small, targeted group of potential clients, you can not only offer a valuable free introductory class on home buying, but you can also get an inside track on becoming their real estate agent of choice. Workshops can be offered either at your office, a local community room, or even remotely, as a webinar. By the way, you can publicize home buyer workshops through a variety of means, including press releases, blog posts, Facebook, Twitter, Linkedin, email blasts, flyers, postcards, word of mouth, cost-effective advertising, and other marketing tactics. Stay tuned to this blog for more real estate prospecting tips, marketing plan ideas, client communication tools, and marketing strategies. Thanks for checking out my latest blog post. Wishing you the best of luck in all your real estate marketing campaigns! *Disclaimer: My blog posts often feature links to marketing templates, services, and digital products for which I am a compensated affiliate. Whether you’re talking about the effective use of real estate prospecting letters or other forms of generating leads, it pays to be an eternal optimist. However, persistence and optimism only go so far if you’re barking up the wrong tree or traveling east looking for the perfect sunset. Don’t reinvent the wheel. Since time is money and eternal optimism has a limited shelf life, avoid the trial-and-error approach to real estate marketing, as much as possible. One way to save time, avoid frustration, and increase your productivity is by using real estate sales letter templates. That way, you don’t find yourself sitting in front of a blank computer screen waiting for your marketing letter to start writing itself. If writing effective real estate letters is not your forte, then starting with a professionally written template can help you avoid the energy-draining process of trying to create a persuasive, targeted letter that will capture your prospects’ attention and prompt them to take action — like picking up the phone, sending an email inquiry, visiting your Facebook page, reading your latest blog post, stopping by your open house this weekend, or whatever action you’d like them to take. Target your audience and customize your message. One of the least effective approaches to mailing out real estate farming letters or conducting and email marketing campaign is to attempt to be all things to all people. Keeping in mind that people like to be treated as unique individuals rather than one of many recipients of a mass mailing, it makes sense to segment your email list and send targeted mailings to postal mail prospects. Capture email addresses of interested real estate prospects who visit your website or blog. You can accomplish that by auto-responder form that is typically offered by many email marketing services, such as Constant Contact, AWeber, GetResonse, MailChimp, Fluttermail, and many other email marketing options. One of the many advantages of using a comprehensive email marketing service is that it includes an opt-in system, which assures that prospects who receive your email messages actually requested and confirmed that they want to be on your list. Opting out is usually as easy as clicking on a link or two, so that virtually eliminates complaints related to people receiving unwanted emails. Increase your visibility and name recognition as much as possible. Even before social media marketing came along, there were dozens of ways to increase your visibility, make your name more recognizable, and generate low-cost publicity. Now, with the availability of all kinds of online real estate marketing tools, the possibilities are only limited by your comfort zone, your budget, and your Internet marketing savvy! Online real estate marketing examples run the gamut from real estate video marketing and text marketing to social media marketing methods, such as Linkedin, Facebook, Twitter, Pinterest, and Instagram. Obviously, it’s not practical to do it all, unless you hire a social media marketing freelancer, agency, or employee to handle social media campaigns for you. Many real estate agents can’t justify the expense of doing that, but with all the cost-effective real estate marketing strategies available to you, an all-out social media marketing campaign is not necessary. Build relationships with letters. Making full use of your email subscriber list, along with sending out the occasional postal mail prospecting letter, can help cultivate ongoing relationships and boost your top-of-mind awareness in your farming area and beyond. In addition to sending our holiday greetings and periodic newsletters, you can also stay in touch with your current and prospective customers by providing local real estate market updates, property maintenance tips, home staging suggestions, just-listed or just-sold announcements, and even lists of trusted home improvement contractors — provided you’re really confident in their ability to consistently provide great service, quality, and value. If you need professionally written content for real estate prospecting letters, referral requests, thank you letters, seasonal “stay in touch” letters, open house invitations, holiday greetings, energy saving tips, letters targeting renters, FSBO prospecting letters, and expired listing prospecting letters, then check out this website. * I’ve been affiliated with them for more than ten years, and I know they provide a valuable resource for real estate agents, Realtors, and agencies. Thanks for checking out my latest blog post on real estate marketing ideas, marketing tools, and prospecting letters. Stay tuned for more ideas and marketing strategies in the very near future! *Disclaimer: My blog posts feature links to products, services, and websites for which I am a compensated affiliate.